A newly constructed house, measuring dimension 20.5 x 35.5 sq.ft, is up for sale in the heart of the city. The house is located in BDA approved, Poorna Prajna Housing Cooperative Society Layout, a few meters away from the Uttarahalli Main road and around 4Kms from Devegowda Petrol Bunk on Outer Ring Road. Click the following link to see the location on Google Maps: Link. Update: This house is sold, however if you are looking for more houses in and around the same area, please do contact us. 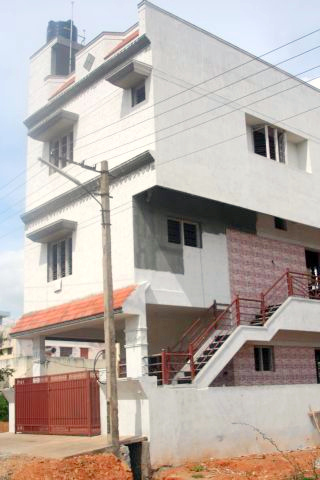 1> Apartment for sale in Padmanabhanagar which gets 17,000 / month rent. Main adjacent areas are Uttarahalli, Bharath Housing Society Layout, Banashakari (BSK) 6th Stage, Padmanabha Nagar. The site is South facing, whereas the main door of the house is East facing. Total built up area of the house is 20.5 squares and the site measures 20.5 x 35.5 sq ft, with 20.5 sq ft to the road. There is a single bedroom house in the ground floor and a duplex house with 3 rooms in the first and second floor. A bore with 5 inch water, which means that you’ll never have water problems. The house is built strictly as per vastu. The house is in BDA approved, with clear titles, which ensures easy availability of loan in any bank of your preference up to 80%. You can also leave a comment with your phone number and availability, I’ll get back to you immediately. PS: If you have requirement for any plot, site or house for sale, do leave a message in the comment section and I’ll get back to you at the earliest. i am looking for 20×30 duplex house individual house to buy. my budget is upto 45 lakhs. please contact me on 9880594754 if any. Looking for constructed house around poorna pragna layout area with a budget of 60 Lacs. Let me know if you know any. HI, Iam Looking For 20 × 30 Site surrounding to j p nagar or surrounding to arekere for Rs 15,00,000/-. I am looking for a constructed house on 20*30 plot area near uttarahalli, arehalli, poorna pragna layout, ittamadu surrounding areas, pl contact me 9886482312 subramani. I am looking out for house in 20×30 site in J P Nagar within 50 lakhs. Please contact me if any one is interested to sale. I want 2 floors or 3floors or duplex house for 30lakhs new building means very comfortable plz let me know if their is any. If a katha building means easy to get loan. I’m looking for 20/30 site in AGS layout, utharahalli, chillakasandra, hosakerahalli… within a decent range. Please let me know if any. Looking for new duplex house 20×30 near by Jalahalli east or west. Need (A )katha for purpose budget 35lac. By next year. required 20 x 30 site or duplex house in poorna prajna layout, chikkalasandra /Ittamadugu/bsk 3rd stage/uttarahalli – kengeri main road surrounding. ph-9448603995 if not picked phone,please send us message. required a newly constructed bldg with good ammenities & at good location, Preferrably in Old Madras Road. Budget is 50 to 55 lakshs. Looking for 30×20 3 floor house, for 65 to 75 lakhs at the decent locality, BTM layout, Banashanki and other ares. I AM LOOKING FOR 20X30 3 FLOORS HOUS, WHERE I CAN RENT THEM OUT INDEPENDENTLY.60 – 75 LAKHS. I am looking for 20*30 site or house near Padmanabha Nagar, Chikkalasandra & Uttarahalli. Let me know, budget 40 lacs. I hope it is south facing site and house built with east facing as per vaastu. I too looking to build in same way for my 20 x 30 south facing site at SMV layout. It would be helpful if you can please share your house planning to show to my contractor. Hi I am looking new built up duplex house for range of 50 Lakhs. If you have any such good house please intimate to me . We want to sale our house in Thyagarajnagar, 15×20, 42 Lakhs. 3 Floors. 20 years old building. Hi Gautham, I’m looking for a constructed house on a 20×30,20×40 house in Bangalore south(Ags layout,ITI layout,ittamadu,Hoskerahalli,kattriguppe,uttarahalli,anjaneyanagar) with clear titles & immediate possession. My budget is 35 to 40 lakhs. Please let me know at the earliest. Hi Gautham, I’m looking for a constructed house on a 20×30 plot in Bangalore south(Ags layout,ITI layout,ittamadu,Hoskerahalli,kattriguppe,uttarahalli,anjaneyanagar) with clear titles & immediate possession. My budget is 35 to 40 lakhs. Please let me know at the earliest. Hi i am looking for the site measuring 30*40 or odd sites also somewhere in 30Lakhs preferrably in ajs,banashankari 3rd stage, ramanjaneyanagar, ppornapragnalayout, and near by. let me know if u have any.. am also looking out for house within 55lakhs. Hi, I am looking for a 30×40 anywhere in BSK 6th, AGS Layout, 5th Stage etc. Budget is 35L. I’m looking at a newly constructed duplex on a 20×30 plot in Bangalore south(Ags layout,uttarahalli,anjaneyanagar) with clear titles & immediate possession. My budget is 50 lakhs. Please let me know at the earliest. I have seen your reply. I would like to inform you that our house is located near Nandini Enclave, Banashankari 3rd Stage, very decent locality and I am also looking for 20×30 site nearby. can u pl let me know the price I will get if i dipose and the price for 20×30 site. I want to buy uttarahalli/Ittamadu/Chikkalsandra, etc. measuring from 800SQft to 1200 and my range will be from 35 to 40 Lakhs Please let me know if any. I want to buy a house in 20x30sq.ft. near uttarahalli, Ittamadu, kengeri Upanagar surroundings. @Nandita – What’s your budget ? I am intrested in 30 X 40 or 30 X 50 sites Uttarahalli main road or poorna pragna layout. Please let me know the availability of sites for immediate construction. I am looking for 20×30 site or house in BSK 2nd, 3rd stage, JP Nagar, Padmanabhanagar, Chikkalsandra, Subramanyapura, Uttrahalli. I am looking at independent home around JP Nagar, BTM, BSK, outer ring road & my budget is depending on the source income & loan.. I REQUIRED A SMALL INDIVIDIAL HOUSE WITH IN 20 – 24 LAKHS IN UTTARAHALLI OR CHIKKALASANADRA OR ANY NEAR BY AREA….CAN I GET IT…. Hello, I am looking for 20 X 30 site in BSK 6th stage. Plz let me know the price per sq.ft and the availability. Do you know of any constructed house in 20X30 site in AGS layout, Ittmadu, PoornaPragnya layout, Hosakerehalli or sorrounding places? Required for living and not as investment so, we prefer residential areas. Budget is ~45lakhs. If you could send me an email, I will send you the details. Roopa- The site rate around Poorna Pragnya layout is roughly around 3500 Rs / Sq ft. A 20 * 30 will roughly be around 20 lks there. If you are interested, I can ask a few friends to help you out. @Prasanna – sorry, I do not have any idea about houses around Hebbal. If I come across anything that suits your requirement, I’ll contact you. 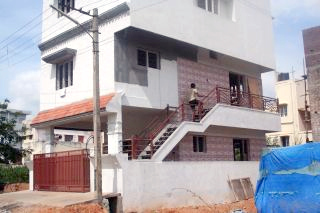 i required constructed house near boobsundra or hebbal around 20 to 25 lakh. I have got a house with clear titles situated near Nandini Enclave construced on 17 x 30 dimension consisting of Ground, First and Second Floor one big room with atached bath room and is in a decent locality. I am staying the I Flor and we are getting Rs.8,000/- per month rent. Can you pl.let me what is the price I may get if I dispose. Awaiting your early reply. Looking for Plot or house 30X40 or 25X35 duplex house, Sourrounding BSK 3rd stage, Hoskerehalli .. Pls help me out ..
@Leela Murthy – Can you drop your cell phone number, I’ll get in touch with you asap. Are there any 30X40 sites/ individual houses available in Poornapragna layout? If so, please let me know the prices as well. @Jayanthi – I’ve mailed you. Please do get back to me with your number. I( am currently looking out for a duplex 3,4 or 5 BR house in and around Padmanabanagar or Kumarswamy layout. Prefer,30*40 and a BDA site. Let me know if you come across any duplex house. @Nirmala – No this is long gone. It went for 58 lakhs, as the prices increased due to stiff competition. If you are interested, then probably we can help you get another worthy property. Leave a message and your telephone number, my cousin or I will get back to you. 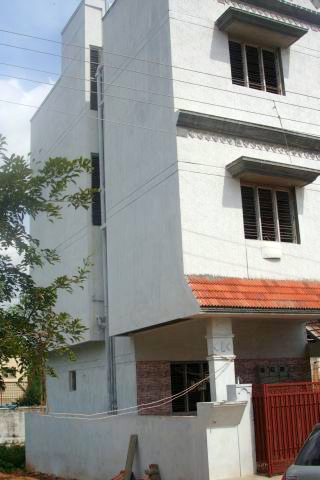 Is this house in poornapragna layout(20.5 * 35.5) still available? I am looking for an house measuring around 1000 sq ft near to ags layout ittamadu uttarahalli kumar swamy lyt or surrounding nearby and my budget is arround 40-45 lakhs. @Deepa – Can you leave your contact email ID / phone number so that we can get in touch with you. I am looking for a Semi-furnished duplex independent house in Bangalore. BuDGET – upto 40-50 Lakhs. Kindly let me know if there is any house avaialabl at present. I am looking for a new furnished house in areas like- BSK, J.P.Nagar, BTM 1st and 2nd Stage, Madiwala and Jayanagar. BuDGET – upto 60 Lakhs.. Even i’m loking for sites in that area – PP housing society, happy valley. Budget – upto 35L, measuring not less than 1000 sq ft.
@Shyam – currently I do not know any in such range, most of the single floored house there would come up around 55 – 60 lakhs, however, if I come across something I’ll keep u informed. Kumar, can you give me your number, so that I can call you ?